Here you’ll find lots of information about the film compiled into one page. Please feel free to copy and paste any text and save any images for use in articles and other publicity materials. If you have any questions or would like additional information, please contact Jeff Kingery (Director/Co-Producer) at jeff@doubleplayfilms.com. Click here to download the entire EPK as a zip file. Bar owner Peter Gryszek falls for a married woman with an abusive husband and plans to murder him. He soon discovers he’s the victim of an elaborate con…one he may not survive. PETER GRYSZEK is the owner of a restaurant and bar. Peter’s dedication to his customers comes first…just ask his ex-wife. Peter meets the alluring AMY CAIN and is seduced by her beauty. Amy complains about her abusive and wealthy husband, CHRISTOPHER. 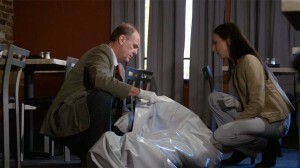 It doesn’t take long for Peter to plan to kill Christopher so that he and Amy can run off together. With murder, nothing is easy. With Amy, nothing is as it seems. Peter soon finds himself the prime suspect in Christopher’s death and his own life hanging in the balance. You were a sports broadcaster on radio and television. Now you’ve made a feature film. Why the switch? I’ve always loved movies and used to shoot 8mm monster and spy movies with neighborhood kids when I was growing up. So you could say it is a return to my first love. When I decided to retire from broadcasting, my one concern was filling the creative void left by not being on the air. I felt writing and ultimately directing movies would be the creative challenge I was looking for and I was right! You broadcast NBA games and Major League Baseball. Any comparisons between professional sports and making movies? Many. Teams look for the best players coming out of training camp. Essentially that’s what an audition does. Managers and coaches then try to put their players in situations where their strengths are utilized. That’s what a director does. He uses the audition process to find the most talented actors and then works with them in their roles so that their particular ability can shine. Do you “win” making a movie like a team wins a game? Certainly. There’s a saying I like in sports – “This isn’t a try hard league, it’s a do good league.” So while you have to have effort to be successful, it’s not enough. You need superior performances from your actors and skilled work from your crew. And the best teams, whether on the field or on the set, succeed because they have a passion for what they do. Also, failure is not an option. In sports, failure can mean the loss of a game. In making a movie, we have the luxury of another take. How did Table 47 come about? My partner, Mike Brody, and I had written a few scripts, but we felt that none of those was right for a first film. Most of that had to do with cost. So our idea was to write an engrossing story, but make a movie that had very few locations, few if any special effects, and zero stunts, all with the idea of keeping costs low. I told Mike of a story that had been in my mind for awhile. It was the basic idea for Table 47. He said he liked it. I said, “You write it, I’ll direct it.” We both put in some money. We found investors that graciously helped us with the rest and here we are. How tough is it to raise money? Tougher than making the movie! It’s not easy asking people to give you money when you can’t guarantee them anything in return. I mean, we hope the film is successful and that we make money, but there is no way to predict that. Our investors understand, but they believe in us and the project. For that we are eternally grateful, because without them, we wouldn’t have a movie. What was yours and Mike’s thoughts about the theme of the film and where you wanted it to go? I’ve always liked film noir. The good guy who gets in too deep with the femme fatale. Then I like the idea of his figuring it out. But is it too late? Does she get away with murder? Does he turn the tables? Does he survive? Our thought in this one was that, “Things aren’t always what they seem.” The main character even says that line. And we tried to be true to that in each character. There is mystery involving all of them, their goals, their needs and how they go about getting what they want. What about the ending. You have two? I’ve always been a guy who stays through the credits. You never know what might pop up. Think of Matthew Broderick at the very end of Ferris Bueller’s Day Off. Or outtakes. Or in the case of Table 47, something critical to the resolution of the story. I liked the idea of having Table 47 end with a certain scene and feeling, then starting the credits and THEN showing another scene before the final fade out. It will create interesting conversations because the audience members who leave at the very end will have a different take on what happens than the person who leaves when the credits start. What did you learn making your first feature, Table 47? Best day on the set? We had a day where our two lead actors, Mike Haskins and Danielle Prall, had very emotional scenes. I’m amazed at whatever place it is where an actor goes to pull up the feelings needed. In our case, it must have been a very dark place. At the end of that day, they asked me how I felt. I felt terrific! Walking on air, because they had given me what I wanted in the scenes. I asked them how they felt and they both said they were exhausted. They’d left it all on the set. They wanted to go home and sleep and I wanted to celebrate. Very different emotions and yet everybody went home happy. Not so much bad, as understanding what making a film is all about and the limits of the crew. We worked on a very small budget. Most of the crew had other jobs. We’d have a crew call for 6am and people would come in having barely slept because their full time job had ended a few hours before. One day we just stopped early and sent everyone home because we weren’t getting good work done. As the shoot went on, we tried when we could to make the set calls a little later. You finish shooting, but you still have to put it all together. For that I thank Jeff Deel. He’s a phenomenal editor who did all our post production work. I think the editor-director relationship is one of the most critical. We were on the same page quite a bit in terms of what we were looking for and he brought all of that to life in the way he cut the film. I also was thrilled to work with Austin Lawrence, a brilliant young talent who composed the music. We are entering film festivals and looking for distribution. As all of that plays out, there will come a time when I start thinking of the next film. I’ve got several in mind, one I wrote and one my partner wrote and one that’s just floating in my head. 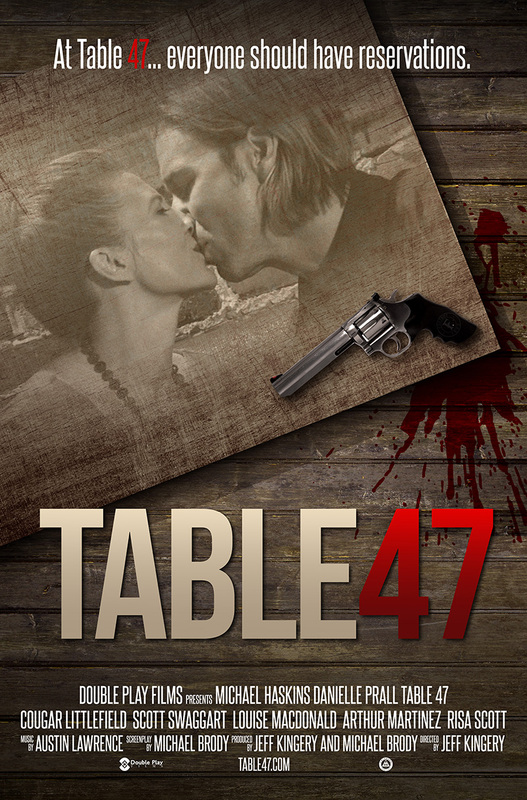 I love film noir and Table 47 is a tight movie in that genre. It tells a simple story about temptation. And consequences. Who did what to whom? What is going to happen? I want the audience to feel themselves slipping into a character’s shoes. Loving or loathing that character. Fearing or wanting to be him/her. They are wonderfully written characters. My job through casting, rehearsal and preparation was to get the actors to the point where they became those characters. What fun it was. Every crew member and every actor brought his or her ‘A’ game to the set. They shared the vision I had for the film and added to it with their own skills. Because of that, a dream came true. For all of us. We not only made a movie, we made one that audiences will enjoy and one that we can be proud of. And I hope we can do it again. 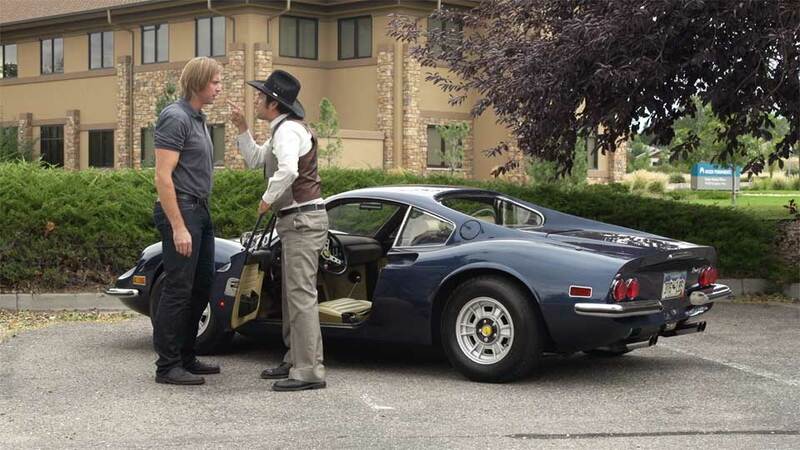 Jeff Kingery makes his directorial debut with the feature film “Table 47,” a neo-noir thriller set in Colorado. Kingery took his passion for filmmaking through high school and college, then utilized those skills on news and sports documentaries and team highlight films at TV stations around the country. Jeff was the radio play-by-play broadcaster for the Denver Nuggets of the NBA for 11 seasons and Major League Baseball’s Colorado Rockies for 17 years. His insight into the pressures found in professional sports and his understanding of competition and conflict permeates his work, and is responsible for his unique “voice” in writing and directing. MICHAEL HASKINS (Peter Gryszek) is a Denver actor who has appeared in numerous short films and made his feature debut in the critically acclaimed and award winning The Aviation Cocktail. He appears in the Hank Williams’ biopic I Saw the Light due for release in late 2015. His television credits include ABC’s Killer Women. Haskins is a practicing attorney in Colorado and has worked with the State of Colorado to revamp its incentive program for media production. DANIELLE PRALL (Amy Cain) got an early start in front of the camera, filming commercials at a young age. Ms. Prall grew up riding horses and became a National Rodeo Champion by the age of 13. She pursued a full time career in Olympic Style Tae kwon do, and in 1999 won her first international gold medal in Barcelona, Spain, and also made a bid for the 2000 Olympic Team. In the summer of 2012, Danielle was cast in her first feature film, Teddy Boy. She has a starring role in Paralyzed With Fear scheduled for release in 2016. When he was eight, COUGAR LITTLEFIELD (Troy Helton) practiced in the mirror doing Michael Keaton’s eyebrow raise from Batman so many times it is now a natural habit. He is a professional full time actor living in Colorado. Cougar was behind the camera for eight years and turned to acting two years ago. Littlefield started a film festival in Colorado for local teens called the Silver Spoon Film Festival. It has been running for over 12 years. SCOTT SWAGGART (Detective Robert Dean) was bitten by the acting bug at age 5 when he was cast as the lead in a Christmas pageant play, The Littlest Angel. His mom was the director. His two most recent on-camera roles were as Officer Frank in the award winning feature, Walk-ins Welcome and as the Old Man in College Pranks. LOUISE MACDONALD (Jill) won Best Actress at The Los Angeles Fear and Fantasy Film Festival in 2013 for her role as Tasha in An American Terror. She was born in London and moved to Colorado eight years ago, where she discovered the stage and screen were her homes away from home. She has performed leading roles in various high school and community theatre productions and is currently attending the University of Colorado in Boulder, where she is studying Broadcast Journalism and Theatre. MICHAEL BRODY (Writer) began screenwriting full time in 2008. He has been hired to write screenplays and pilots for actor/director Rockmond Dunbar (Prison Break, Sons of Anarchy, The Mentalist). He was signed by Intrinsic Value Films to write a biopic about the writer Norman Mailer. Brody wrote The B Team for veteran actress/producer Alexandra Paul, with John Cleese attached to star. KEN HENDRICKS (Director of Photography) is an award winning cinematographer who has numerous indie feature and short productions and over 3,500 television productions to his credit. Mr. Hendricks recently won the Best Cinematography award for his work on The Clearing at the Newport International Film Festival in Newport, England (Wales). He has 30 years experience in analog and digital video photography. AUSTIN LAWRENCE (Composer) created the haunting score for the moody thriller Table 47. He is an award winning composer who has created memorable scores for over 25 feature and short films. He won Best Musical Score at the “Almost Famous Film Festival 2012″ for his emotionally charged score to The Eleventh Hour. Peter Gryszek (Michael Haskins) and Amy Cain (Danielle Prall) enjoy their affair which soon leads to murder. Troy (Cougar Littlefield) tries to calm Peter Gryszek (Michael Haskins) as evidence mounts against Peter in a murder investigation. 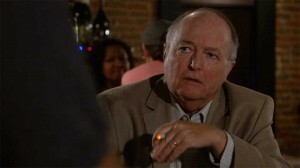 Peter (Michael Haskins) confronts abusive husband Christopher Cain (Arthur Martinez) over Cain’s wife, who has been beaten. 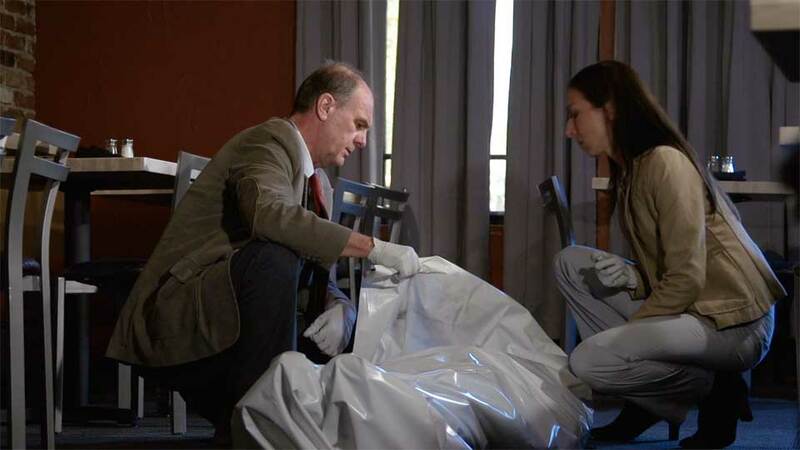 Police investigators (Michael Vasicek & Batya Haynes) investigate a murder. Behind the scenes: Director Jeff Kingery (foreground) and Director of Photography Ken Hendricks walk through a scene with Michael Haskins and Louise Macdonald. Behind the Scenes: Director Jeff Kingery, Gaffer Samantha Randel, Director of Photography Ken Hendricks and Assistant Director Matthew Mertens prepare to shoot a scene in Table 47. Behind the scenes: (L to R) – Key Makeup Artist Sarah Clark and Costume Designer Terra Brody make final touchups with actor Cougar Littlefield.